Our track record with Anheuser-Busch goes back almost a decade. We started off developing test-market promotional websites that corresponded with on-premise promotions. The success of the those early projects allowed us to continue a long and great relationship building cutting edge websites, kiosks, and mobile applications for the world’s largest brewer. Over that time we have created some of the most successful online campaigns of the last decade with Bud Light and Maxim magazine. Year after year, we were brought in to brain-storm, create, and execute new and fresh ideas with the Bud Light brand team and some of the hottest Ad Agencies on record. Some of our programs included: Bud Light Live, Bud Light / Maxim Exposure, Bud Light Double Exposure, Bud Light Jet Set, Bud Light Truth or Dare, Bud Light Party Maximus, Bud Light Dating Game, Drink Innovations (all A-B brands), and Bud Light Rock Paper Scissors. This project included an on-premise kiosk and companion website. We created an interactive chat experience utilizing Flash video and a database of responses. The idea was to have the user interact with a virtual Maxim model in an online chat session. We had to shoot hundreds of video clips, edit the hell out of them, and tie them into a database of chat commands and key phrases. The end result was a huge success and probably led to a number of office firings. What do you get when you mix the world’s number one beer brand, the hottest magazine in the country, and unbelievable looking people? 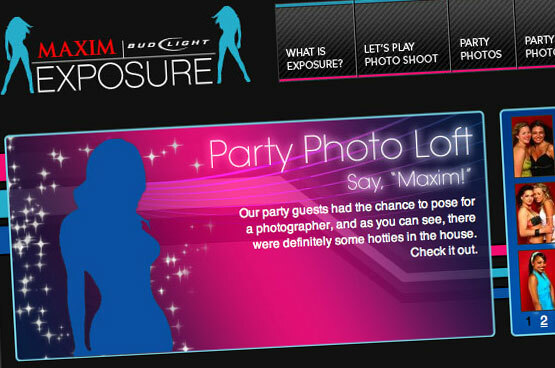 Well, you get Bud Light / Maxim Hookup. The name says it all and once again we were on board to create a website that spanned 40 cities and promoted each of the Bud Light brand’s wholesalers in their respective markets. The website included photos, video, and hot wannabes showing off their best celebrity status. Since a number of these beauties weren’t to shy, we developed a legal approval system so “the suits” could cut out the really good stuff! Oh well, we still got to see it. Double Exposure was the follow up to a very successful campaign dubbed “Party Maximus”. 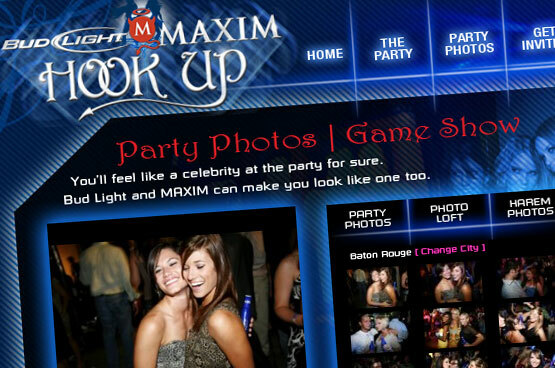 After realizing that people loved to see themselves on the Internet, Bud Light and Maxim stepped it up a notch and added some extra weight to the program in their sophomore effort with this program. We created a system where it was easy for people to find themselves having fun with the Bud Light brand in the city they lived. This was before the era of MySpace and facebook so the traffic was through the roof on this site. Beer sales were significantly increased during this national promotion. Call it Ro-Sham-Bo, call it Rock-Paper-Scissors, or call it whatever you want. 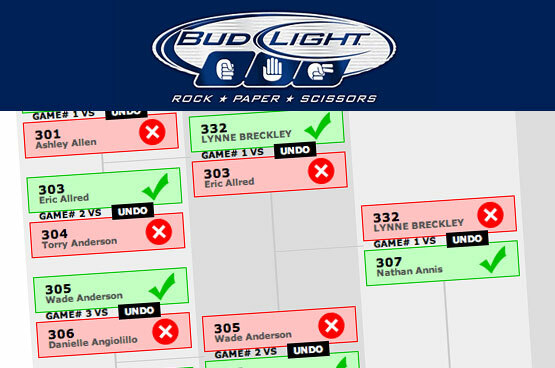 Bud Light decided to capitalize on the huge popularity of this game and had us create a head-2-head bracket system for their championship tournament in Las Vegas. The system was used in bars around the country and culminated with a $50k championship that was powered by our software. We created a customized bracket system that allowed the event staff to input player’s names, generate brackets, and manage the tournament with the click of a mouse. Of course, Internet access was spotty in the Casino so we created the system to run on a laptop regardless of an connection. The results were exported to an Excel file for reports and stuff.